“After living and working out of the area for 24 years, we are happy to be back in my native East Tennessee” Dr. Dale Pittenger said. 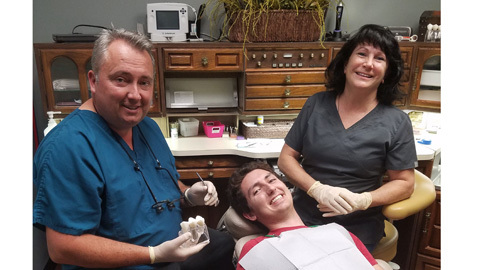 He and his wife Gina are both dentists and purchased Karns Family Dentistry two years ago. “This is our fourth and LAST dental practice and now that we are back in God’s country, I’m glad to be home,” the Knoxville native said. Dr. Pittenger was chosen to attend additional training at Langley Air Force Base as a Captain in an Advanced Education in General Dentistry program, training that goes well beyond dental school. Dale and Gina are proud to own a Karns “mom and pop” business as many dental offices are now becoming corporate-owned entities. They have spent the last two years renovating and upgrading the family dental practice to provide a wide array of services. Dale and Gina enjoy hiking the beautiful Smokies, camping and motorcycle trips on his Harley. Both have made international dental mission trips. Karns Family Dentistry is located at 7443 Oak Ridge Highway and you can call them at (865) 691-8166, visit them at www.karnsfamilydentistry.net or on Facebook. Their office is open Monday through Wednesday 8 a.m. to 5 p.m. and alternating Thursdays. Move to the Magnolia State!